The animals at Mooseys Country Garden aren't shy of the media! Some of them have become so popular that they appear on other people's websites! Most Valuable Pet Contestants earn 10 bonus points per website appearance. If you spot an MVP contestant on another website please email us and we'll award the points. The spirit of Big Fat Sifter lives on long after he left Moosey's Country Garden. Perhaps he has sifted off to Spain? I don't speak Spanish but I can get the gist this article is about problems with cat aggression. Sifter also gets a mention on In perfeita a blog from Lisboa, Portugal. Sifter apparently also "needs to brush up on his kitty ninja skills!." 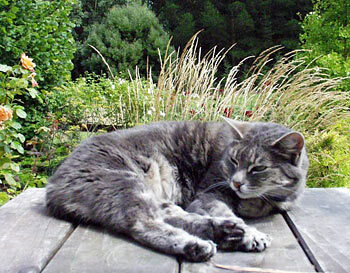 www.whatagoodcat.com says that "Stumpy, Sifter and Jerome are the attractive Kiwi cats." www.suite101.com : "What style of gardening is this?" asked Stumpy the cat." Moosey doesn't like the poultry much. She actively discourages poultry-voting in the forums and refuses to spell any poultry group members names properly to avoid poultry receiving page votes. Despite her efforts the poultry are popular. They've been spotted at May I Write's blog. The rooster also cropped up chasing Tiger at www.petervcook.com. Taj-dog gets a mention on the The Whole Dog Store.